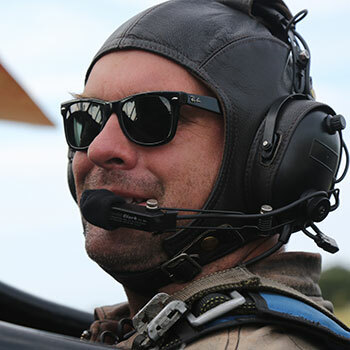 I really want to take this opportunity to thank Marilyn for being such an incredible instructor while teaching me to wing walk and Mike for being such an awesome and talented pilot. Both of them made me feel safe and excited about my thrill seeking, wing walking adventure. This was truly a bucket list item of mine that has been fulfilled made possible by my boyfriend Kevin during Operation Nifty Fifty, my 50th birthday celebration trip. I highly recommend Mason Wing Walking Academy for anyone seeking to chase their dream of wing walking. Thanks again for the best day ever, you guys rock. If anyone is even just thinking about trying this do yourself a favour and book in. No words on this site will do the experience justice. Truly Awesome. Today I'm traveling back home to Qatar, but I just wanted to thank you both for the great time I had while I was training on wing walking, you made me feel like being at home, and I truly enjoyed this experience. I'm planning to come back in the summer if I can escape from my work. How do you thank a family who gave you one of the best days of your life? Changed my life actually. I would put my life in their hands any day. Their family is so wonderful I thought about kidnapping one of their children. Will be one of the best things you ever do in your entire life. Feel the fear and do it anyway. Amazing, life long dream come true! Marilyn and Mike are very professional and safety conscious. They are offering something that no one else does. If you are thinking of trying this, stop hesitating and call. You will not regret it! We could not have had a better day. The Mason's are exceptional people and the wing walking was mind blowing. I hope to come back and do it again. 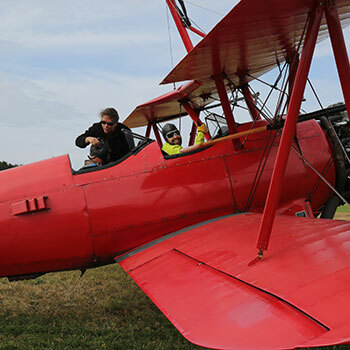 - A family from Sequim is carrying on a death-defying tradition, with help from a vintage airplane. They're "wing walkers," who practice the art of climbing outside a biplane and hanging on as the pilot performs aerobatic maneuvers. "It's freeing, you're up there in the wind, enjoying the beautiful view," Marilyn Mason said. "It really is an amazing feeling. It's hard to describe unless you've done it." She and her husband aren't the only family members doing it. Two of their six children are also experienced wing walkers. "(I) get mixed reactions," said 14-year-old Weston Mason. "Some are like, 'that is crazy, I would die.' Others are like, 'ooh that's cool, can I go?' I think it's great. I love doing it." So does his little sister Allison. She may be the youngest person to wing walk, ever - just 10-years-old when she first went up. "The first step out of the cockpit is really the hardest," she said. "But then you really don't even think about what you're doing, because you just practiced for hours." Allison and her brother actually practiced for years, before taking flight. 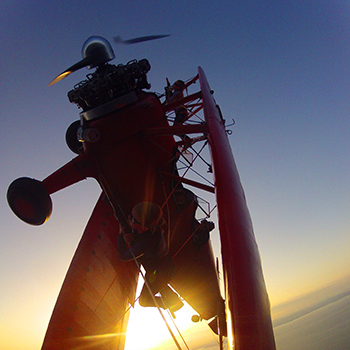 They're fourth generation wing walkers, following in their dad Mike's footsteps, who also wing walked as a teenager. "My grandfather had an airplane like this," Mike said. "My uncle had one, now we do. And it's great to pass the tradition on to the kids." When the family isn't flying, Marilyn operates West Coast Spin Doctors, the only business of its kind in the world. 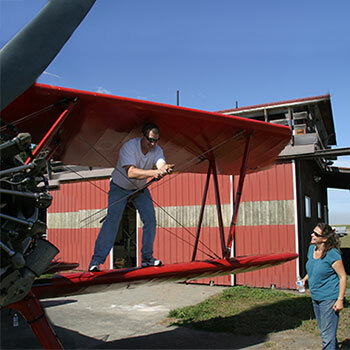 She teaches wing walking techniques to paying students, who've traveled to the Olympic Peninsula from all over the world just to learn.